Front Binding (V. I and VIII) – Plutarch’s Lives, or as the title page reads, “The Lives of the Noble Grecians and Romans Compared Together by that Grave, Learned Philosopher and Historiographer Plutarch of Chaeronea”, is one of the earliest biographies we still have access to today. 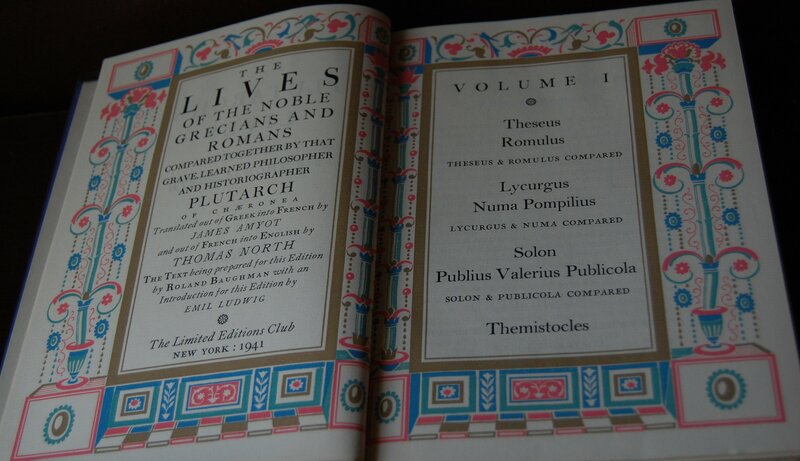 Plutarch details and compares the lives of various prominent Greek and Roman citizens within this set. The Limited Editions Club unveiled an eight-volume set, designed by W.A. 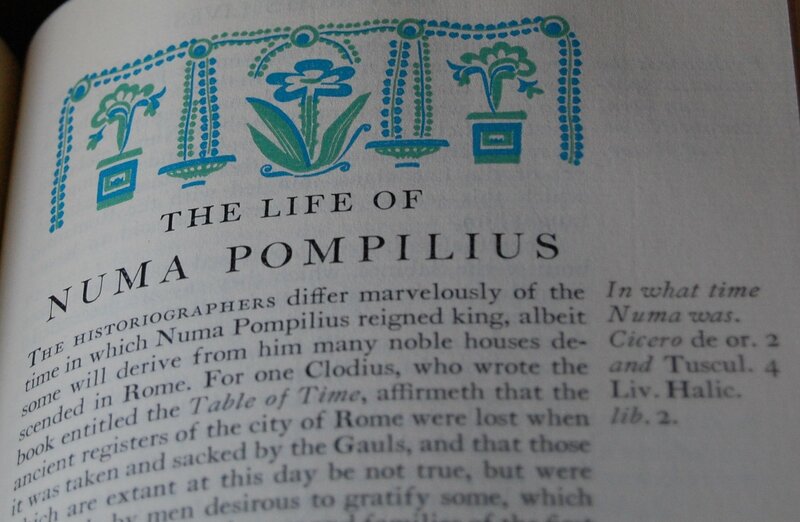 Dwiggins and utilizing the translation of Sir Thomas North, for release in 1941 in the 12th series. On the outside it’s fairly sterile. The brown stripes you see are from the slipcover my university applied to the outside to protect it. 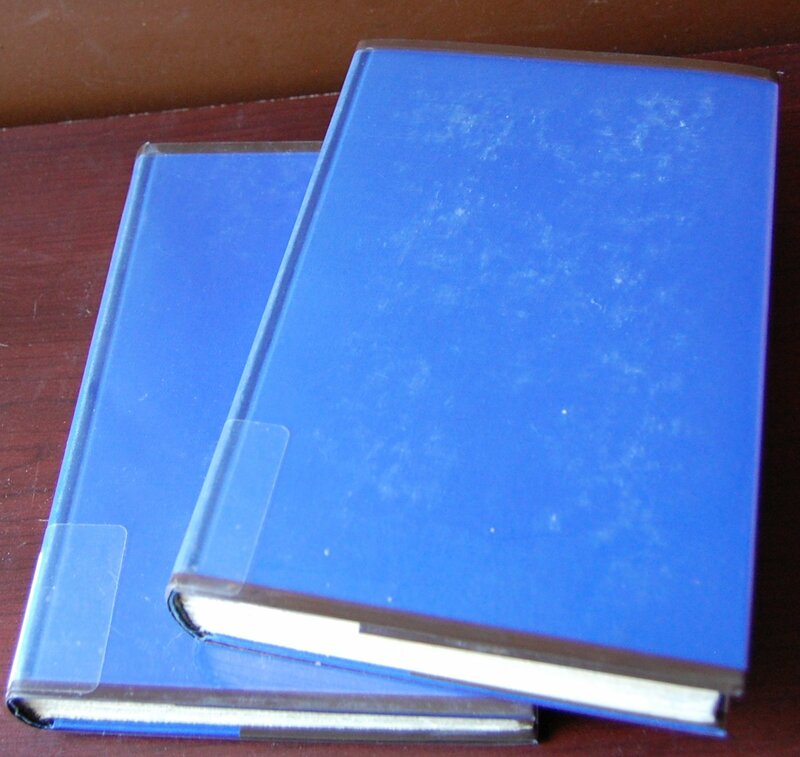 The vibrant blue cloth features eight unique stamps by Dwiggins, one per volume, on the spine. It was printed by the Southworth-Anthoensan Press in Portland, Maine. I don’t have a Monthly Letter, so that’s about as far as I can go design-wise. This was the sole work of Plutarch commissioned by the LEC, which is appropriate, considering it’s the best-known of his surviving works. The Heritage edition condenses this set from eight books to just two, and the binding mimics the title page of this edition (minus the color). It’s even white! As for Mr. Dwiggins, I haven’t detailed his career yet, so let’s get cracking! His full name was William Addison Dwiggins. He was a prominent book designer, type designer (Caledonia and Electra are his), and illustrator, and was a busy man working for Alfred A. Knopf in the 1920’s and ’30’s, heavily influencing the direction of book design. He coined the term “graphic designer” in 1922 to describe his work. For George Macy, Dwiggins did illustrations on top of book designing, but I may not detail every single book he had a hand with right off the bat. I’m going off of Bill Majure’s list, which only tells me which books he put his name in via signature. So consider this a tentative list. Dwiggins was involved in the very first series, doing work on Alphonse Daudet’s Tartarin of Tarascon in 1930. Droll Stories by Honore de Balzac came next in 1932. 1936 saw Rabelais’ Gargantua and Pantagruel see release. This set came next in 1941. He also had a hand in one of the club’s ultra-limited releases, Towards a Reform of the Paper Currency, which only had a limitation of 452 copies when it was released in 1932. That’s all Majure lists of Dwiggins’ output, but I can add two more to that list. He had a hand both in decoration and book design on The Shaving of Shagpat (1955) and The Adventures of Hajji Baba of Ispahan (1947). He passed away in 1956. 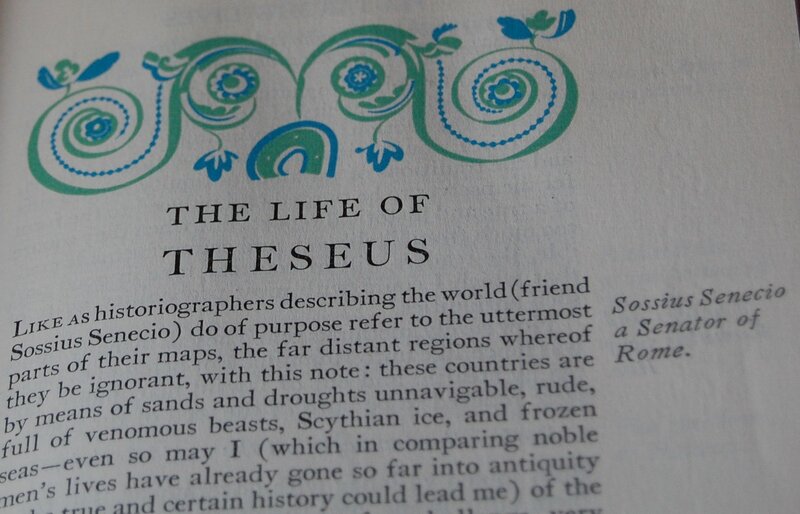 Title Page – Much like The Shaving of Shagpat, Dwiggins renders Plutarch’s Lives with his trademark decorations. These are the only illustrations in the book. James Amyot and North get full translation credit, while Roland Baughman serves as the LEC editor for this edition. Emil Ludwig, biographer and author of Napoleon, offers an introduction. Signature Page – This is one of those special runs of a LEC that is not numbered but initialed. I wish I knew who N.M. was, but alas, this is the first book with those initials I’ve come across, and all of the other LEC’s at my university library were numbered. 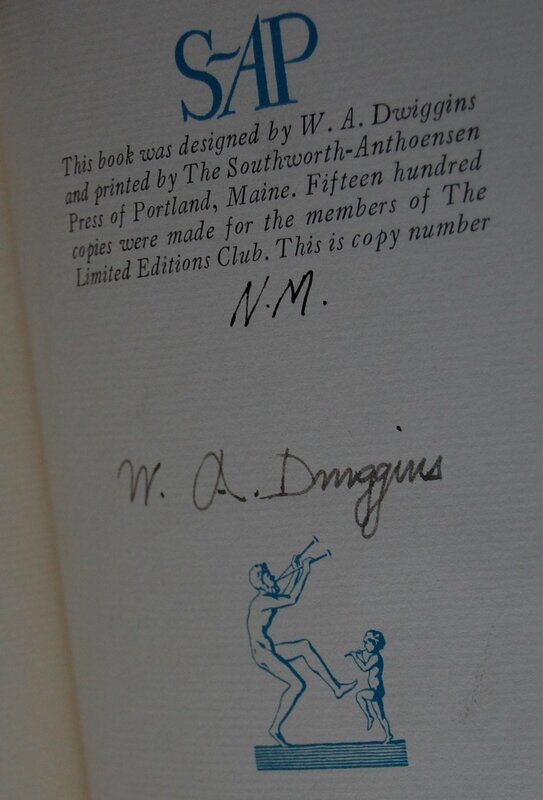 Dwiggins provides his signature. Page 3 – An example of Dwiggins’ pre-chapter headers, which are all the colorful flourishes the book gets beyond the decadent title page. Personal Notes – I checked this out from my university to document it for the blog, but I would not decline owning it myself. I have seen one set out in the wild, and the slipcase is a ginormous orange box that seems like it would shatter if the circumstances were right. I think two slipcases would have been ideal, but I didn’t design the book! I’ll see about getting the Heritage printing (oddly enough it too is at my university library) on here once the next semester starts. If you have the Monthly Letter, I would greatly appreciate hosting it and expanding the contents of this post! Please drop me a line in the comments here or through my thread at Librarything. Thanks! You are currently viewing the archives for June, 2012 at The George Macy Imagery.